In the city of Mokpo, South Korea we can see a very mysterious aircraft, which cannot possibly be in flight or parked where it appears to be! Look closely at the shadows of the plane and surrounding buildings, and you’ll agree that the plane must be very near to the ground. So near in fact that it couldn’t be airborne1, as it would have already collided into one of the tall surrounding buildings. So then the only conclusion is that the plane must be resting on the buildings, right? Well, this plane is likely to be an Airbus A3002 (a passenger jet which carries around 300 people), and even completely empty it would weigh almost 82,000kg – which is rather a lot of weight for a building to support. And how would it have come to be there anyway? Reader Graham, who spotted this sight, was kind enough to actually visit the area in question to see if the plane was still there, and how on earth it was being supported. Unfortunately a thorough search of the area proved fruitless, as there was “no sign of anything that could even remotely resemble an aircraft of that size”. Finally, to add to the intrigue, why does the right wing appear to blend into the background of the satellite image? Hmmm…..the shadows look plenty authentic to me. That five-points intersection nearby ought to be very easy to find so one ought not to have to scour the area to long to locate the building in question. Published: July 27, 1993 A South Korean airliner crashed on Monday in the southwestern coast of the Korean peninsula, killing 66 of the 110 people aboard, airline officials and news reports said this morning. Looking at the angles of the other shadows of the buildings around it I am going to stick my neck out and say that I reckon that the plane is in flight, but is probably a few hundred feet up probably coming in to land or just taken off. The angle of the sun has probably caused the strange close shadow effect. Is there any airports nearby? The Cafe plane talked about on the Google Earth hacks page http://www.gearthhacks.com/downloads/map.php?file=11850 is not the same plane as the one reported here – different city. However it could be another Cafe plane with the right wing being a ramp into the body. First of all, it’s definately a 747. You can see the cockpit window in the front. I’m going to bet that it’s supported above those buildings. All other 747s in Google Earth, you can see the engines. No engines visible on this one. Plus it is too convenient that the plane just happens to fit perfectly within that city block. Forgot….plus it’s completely white and you can see 747 shape in shadow at front. hi, i’ve lived in korea for a while and i can tell you that plane shell restaurants are relatively common. although most are with ww2-era planes, it’s perfectly possible, given mokpo’s airport, for this plane to be for real. Check this spot for an aircraft without an airport: 56° 4’9.58″N 9°59’9.34″E It is real – I have passed it on the freeway several times. definitely agree that it is on the ground and i would also agree that is looks to be a Boeing 747.
notice the blue roof building between the right wing and rear of the plane…the building is casting a shadow on the body of the plane. plus i don’t see the end of a runway anywhere nearby and there is no idication of damage from a crash. Worth noting, anyway, especially in comparison with the jumbo jet. Incidentally…. if this is an actual passenger plane, maybe it CAN rest atop the buildings, if its weight was spread out and it was held in place? I was also thinking it was a restaurant, and the right wing is dipped down a bit (thus blending into the rest of the landscape) because it is an entry point. You enter via the wing and have your seats in the fuselage. Of course the weight would be significantly lower with much of the hardware necessary for flight (like the engines) stripped out. Also, while the shape certainly looks like a 747, the length could really only make it a 747SP. At least that model was flown by Korean Air, so it’s not entirely implausible. But the wings are definitely way too short. Maybe they are mock-ups attached to a proper fuselage … to save more weight and stay within the confines of the plot of land? I would say that it is the angle of the sun making the shadow look so close. The right wing is blended I would say because of the photo blending edge as they stitch the photos together. And yes you can see the motors. This def looks like a B747 from above. About 10 years ago I sold an old Air Atlanta L1011 Tristar to a Korean person. The aircraft was in Manston in the UK. They cut it into large sections and shipped it to South Korea to be reassembled and used as a restaurant. It would be great to find the old L1011 on google earth. i used to live in mokpo and i was there while this was being built in 2000. it was a plane restaurant/cafe, i have no idea what it is now. if you look south of it, near the water, there should also be a sailing ship restaurant, somewhere in the peace park area of the waterfront. It’s not one of the Korean 747SPs. Korean only had two of the type and they were both flown into storage in the US many years ago. One has since been scrapped, while the other is being refurbished to go back into service as an engine testbed. I personally don’t think this is an SP… It doesn’t look “stumpy” enough. I suspect either these wings were shortened, or wings from a smaller aircraft were substituted just for space saving considerations. Koreans like exotic settings. Throughout the country you can find restaurants that look like cruise liners – downtown Seoul on the north end of the Olympic bridge for example. In this case, it is a real aircraft fuselage that has been converted into a restaurant. 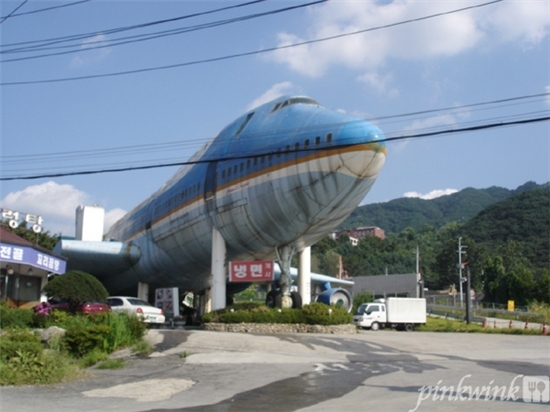 There is also a KAL airliner that was also converted to a restaruant in Yongpyong east of Seoul. The rudder is missing from the tail, and the engines appear too small to be original. I agree with what some other people have said: this is probably a fixture on top of a building i.e. like a restaurant. Tons of old planes are used for this purpose in asia. Update: And here’s confirmation – http://www.luxuo.com/2008/07/boeing-747-turned-into-restaurant.html. JDK, I don’t think that blog is correct. Look at the road that curves around the plane in the photos. There’s nothing like that on the map. So that would leave the Mokpo plane as yet unidentified. There’s some variance where Namyangju is if you search for it in live maps or follow the link in Wikipedia … but it appears the Wikipedia one is correct. And in that case it’s right between two strips of hi-res images … bummer. It is no longer in the 2007 imagery. It is in the 2004 imagery. Perhaps that explains why the blog shows a curved road in front of it. I’m betting it has been moved and the blog shows photos of it from the new location. The plane that is shown in all the pictures and web sites is actually here.